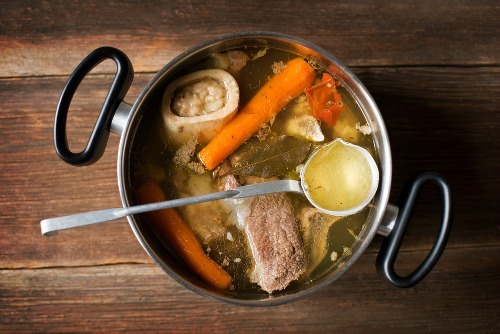 Much has been written about bone broth benefits in recent years. Bone broth is a staple food in almost every cuisine on the planet with thousands of varieties of soups, stews and sauces that use it as a base. But it’s also been used medicinally too. Mothers and grandmothers all over the world have served up chicken soup in a myriad of forms as a remedy for common ailments. Healing systems like Chinese medicine value it to treat a wide variety of afflictions. 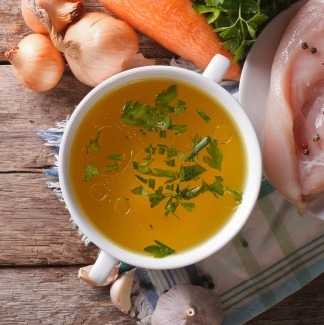 A South American proverb goes so far as to say, “Good broth will resurrect the dead.” While I wouldn’t go that far, I will say I’ve experienced many bone broth benefits in myself and with nutritional therapy clients. That said, when a food becomes trendy, so do exaggerated health claims. As much as I love bone broth, I’ll be the first to admit that it’s not a cure-all. But its widespread use suggests there’s something beneficial about it. 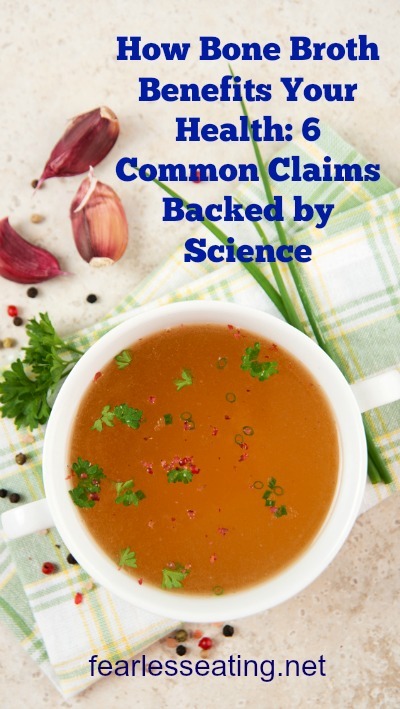 What I want to do in this post is to summarize the most common anecdotal claims of bone broth benefits which also have some scientifically backed evidence. Bone broth is simply animal bones and other parts attached to bones (meat, joints, tendons, ligaments, cartilage, etc) that are simmered in water for extended time periods. From a culinary perspective, this simmering helps to develop flavor. Vegetables, herbs and spices are often added for additional flavors. Short-cooked versions (up to a few hours) with more meat than bones (because meat adds flavor) are called “broths” and are used as a base for light and flavorful soups. Longer cooked versions (up to 8 hours) with more bones than meat are called “stocks” and are used as a foundation for heartier soups and different types of sauces. Because stocks are simmered for longer periods, more of the bones and attached parts break down, which creates a thicker, more gelatinous liquid. In the health and wellness world, it’s these longer cooked stocks that gained a renewed interest. 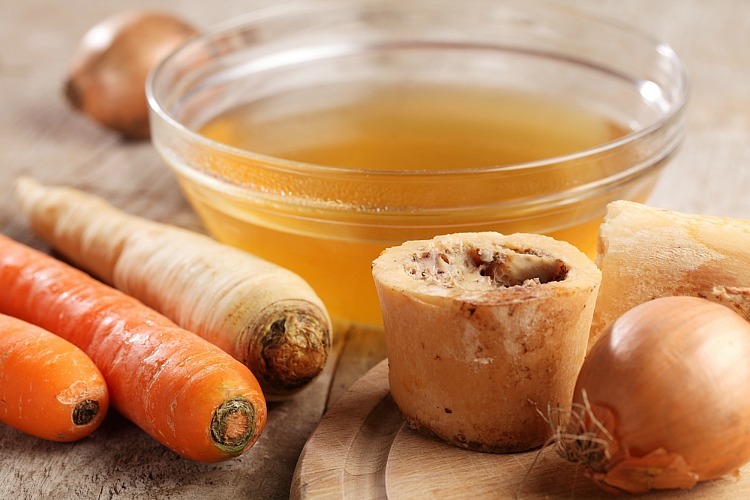 For somewhat interesting reasons bone stocks have become more commonly referred to as “bone broths” in the health world, even though they’re very similar. The slight difference is that bone broths are often simmered for even longer periods than bone stocks. The purpose of this is to extract as many nutrients as possible. This may contradict culinary instincts, but unlike chefs, health practitioners are not as concerned about getting a perfect clarity of a stock or even achieving an exquisite taste (though it will still taste good!). Nutrient extraction is the main goal and the longer you simmer the bones, the more that happens. 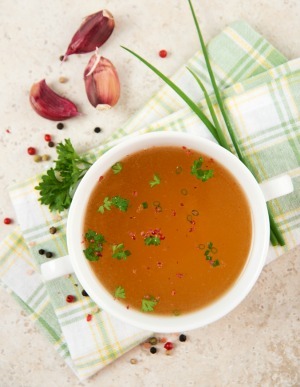 What Nutrients are in a Bone Broth? First, let’s understand that the nutrient content of bone broths varies depending on many factors – types of bones used, volume of water used, length of cooking time, the age, diet and health of the animal and any added vegetables and herbs. 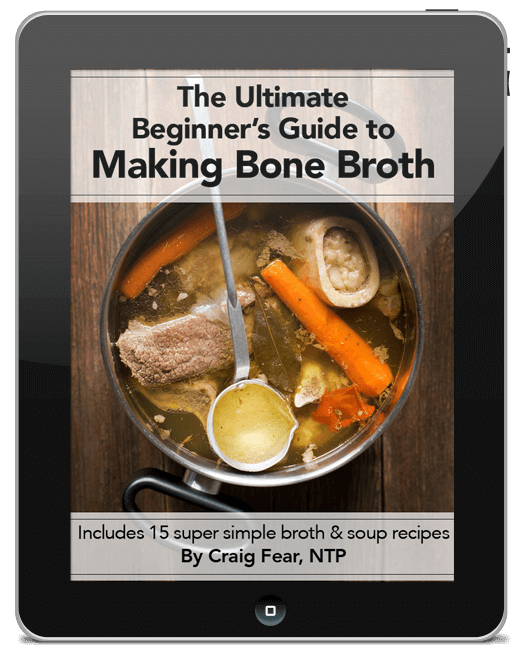 No two bone broths will ever have the exact same nutritional value! That’s pretty cool when you really think about it. Pretty obvious, right? I mean bones are made of about 50% minerals, the majority of which is calcium and phosphorus. It also contains magnesium, sodium, potassium and sulfur as well as trace minerals. It stands to reason that bone broth would be a great source of minerals. Actually, there’s some evidence to suggest otherwise. We’ll explore that in the “Bone Broth Benefits: Bone Health” section below. Collagen comes from the Greek word “kolla,” which literally means “glue,” and it’s the substance that in many ways keeps us glued together. It is the main protein in mammals and makes up about 25% – 35% of our body’s total protein content. Collagen forms the strong but pliable connective tissues that stretch, bend, and jiggle – notably, tendons, ligaments, cartilage, joints, and skin. 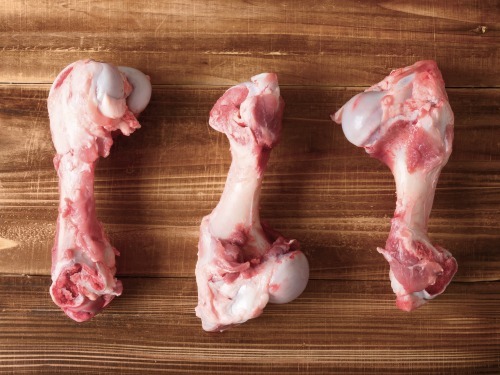 This is why a good nutrient-dense bone broth will contain a lot more than just bones. You can see evidence of collagen when a long-cooked collagen-rich broth cools in the fridge. It will form gelatin and jiggle just like Jello (whose primary ingredient is gelatin). Gelatin is basically cooked collagen and is rich in some key amino acids that are not easy to obtain in our modern diet. Three of them, glycine, proline and glutamine are the most abundant amino acids in bone broth and play some key roles in keeping us healthy. Proline plays roles in building healthy collagen including the lining of our arteries and skin. It also helps build healthy cartilage. Glycine plays roles in the synthesis of our DNA and RNA, hemoglobin, bile salts, stomach acid secretion, wound healing and reducing inflammation. Glutamine plays roles in gut health, immune health, liver health and detoxification, muscle-building and brain health. All three are known as “conditionally essential” amino acids meaning the body can produce them naturally except for certain conditions such as times of illness or stress in which case we need to consume them from food. However, because so many people are chronically ill and stressed today and because so few consume gelatin-rich foods anymore, some health practitioners believe most people are deficient in them. These are extremely large and complex molecules made of proteins and sugars known as glycosaminoglycans (GAGs). Their primary job is to attract and hold water thereby providing cushioning and lubrication to our cartilage, skin, muscles and bones. I like to make the analogy that proteoglycans are to our body like oil is to the engine of a car. Three are often highlighted for their physiological significance and have thus become popular in the supplement industry. Hyalauronic acid is highly concentrated in skin tissue. Glucosamine helps to create and renew cartilage. And chondroitin sulfate helps to cushion and protect cartilage. While there’s limited research on bone broth as a whole food, there is quite a bit on the individual nutrients in bone broth. Keep in mind, most research is done for the purpose of developing new drugs, thus there’s not a lot of incentive to research the benefits of whole foods. I find it interesting that scientific studies done in labs (frequently done on mice or rats) are often given more credence than hundreds of years of practice and observed benefits. That said, it’s good to reference some proven studies to weed out the more exaggerated claims. So let’s take a look at the six most common claims of bone broth benefits that also have some evidence to back them up. Of all the claims of bone broth benefits gut health is probably the one that’s most widely experienced and studied. For centuries, traditional folk medicine has prized its ability to help ease gastrointestinal problems. I can personally attest to the benefits I experienced to my own digestive health when I started consuming bone broth on a regular basis many years ago. I can also attest to the many nutritional therapy clients I worked with who experienced similar improvements in their symptoms. Perhaps it’s the hydrophilic properties (meaning it attracts water) of the gelatin in bone broth that makes it so effective as a digestive aid because it can act as a sort of lubricant and help facilitate food through the digestive system, easing issues with more hard to digest foods that can cause common problems like indigestion, heartburn, chronic bloating and IBS. Although few modern-day doctors recommend bone broth anymore, prior to World War II and the rise of pharmaceuticals, doctors were much more open to using food as medicine. Dr. Kaayla Daniel, in her thoroughly researched article, entitled “Why Broth is Beautiful,” discusses the role gelatin played in the medical profession in the first part of the twentieth century. She cites numerous researchers who studied its benefits and doctors who used it therapeutically with patients for an assortment of digestive problems. And there’s quite a bit of modern-day research on the nutrients in bone broth to back this up. For example, this study showed that the glycine in gelatin can with stomach acid secretion. This study demonstrated that glycine can also help repair ulcers (source). Studies have also been done on gelatin and glutamine showing how they help support and regenerate the mucosal lining of the intestinal wall (source, source) which could potentially aid inflammatory conditions like celiac disease, colitis, ulcers, and Crohn’s disease. This is just the tip of the iceberg as more research continues to show potential benefits between gut health and the nutrients in bone broth. Whatever the mechanisms at play, I think it’s safe to say that of all the bone broth benefits, gut health is at the top of the list. It’s Notre Dame vs. Houston in the 1979 Cotton Bowl. Legendary quarterback Joe Montana is sick with the flu and suffering from signs of hypothermia. He’s so sick he can’t return after halftime. Houston builds a 34-12 lead halfway through the 4th quarter and the game seems all but over. In the locker room, the coaches give Montana chicken soup. He returns and leads Notre Dame to a 35-34 win, considered one of the great comebacks in college football history, and the game goes on to become know as The Chicken Soup Bowl. Proof of bone broths’ immune boosting powers? No, but a landmark study by researchers at the University of Nebraska in 2000 found that chicken soup had a significant ability to inhibit neutrophil migration, meaning a significant ability to reduce inflammation. Other research has shown proteoglycans can stimulate the production of different types of immune cells (source). Modern science is confirming what grandmothers have known for ages! Bone broth has been used as a treatment for the flu, colds, coughs and sinus issues for hundreds of years all around the globe. Chicken soup is often called “Jewish penicillin” because of its use in Jewish cuisine to treat and prevent illness. The secret ingredient that makes it so potent? Gelatin-rich chicken feet, a staple in Jewish chicken soup recipes! 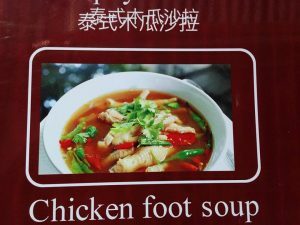 In my travels in Asia, chicken feet were sold at almost every food market I encountered and chicken foot soup was not uncommon. The image on the right is a picture I took of a menu from somewhere in Thailand. Furthermore, we’re only just beginning to understand that there is an intimate relationship between the gut wall and the immune system. About 70% of our immune system is embedded within our gut wall and a compromised gut wall (known as “leaky gut”) can lead to more complex autoimmune issues. The amino acids in collagen and gelatin are an integral part of a healthy gut lining and therefore, healthy immunity. Osteoarthritis, a condition that affects tens of millions of Americans, is a degeneration in the cartilage of the joints. Basically, the proteoglycans, the large cushioning molecules responsible for good joint health, are no longer regenerated efficiently leading to pain, inflammation and swelling. Research is starting to vindicate the many benefits of the nutrients in bone broth for joint health. This study done on 100 women (between the ages of 40-70) using collagen peptides showed “a clear and significant effect at 6 months of treatment” in relief of osteoarthritis. Another study of 147 athletes with joint pain showed significant benefits in those that supplemented with collagen hydrolysate for a 24 week period. It stands to reason that the widespread disappearance of gelatin-rich foods from our modern diets, which contain the very proteoglycans necessary for good joint health, are at the root of the epidemic of osteoarthritis problems in industrialized countries. How many people do you know that willingly eat the fattier cuts of meat, the bone-in cuts of meat and the juicy gelatin-rich gristle? How many do you know who make their own soups and stews from gelatin-rich bones and parts like feet, heads, necks, backs, wings, etc? My answer from my immediate circle of friends and family is NOBODY. I’d guess your answer would be similar. When I worked with digestive health clients, one of the most commonly reported side benefits of consuming bone broth was an improvement in skin health. Clients would often tell me of chronically dry or cracking skin that would disappear, especially on their hands and feet. They’d say their overall skin tone just looked better. Sometimes I could see it myself when they came back after a few months! It makes sense because your skin is made of collagen and proteoglycans too, especially the inner layer below the surface. Research performed in 2014 on 69 women between the ages of 35-55 that supplemented with collagen hydrolysate found a significant improvement in skin elasticity. Other studies have shown hyalauronic acid to be an important nutrient in keeping skin supple, hydrated and smooth looking. It’s thus become a popular nutrient in anti-aging cosmetics, skin creams and supplements. But a good old-fashioned bone broth is surely a less expensive source with benefits that go far beyond just youthful looking skin. Personally, I tend to sleep better when I have a good broth-based meal at dinner. I always thought it was because of the minerals in broth and that could certainly be part of the reason. Minerals after all have a calming effect on the body. Magnesium in particular, helps to relax our muscles and may contribute to broth’s calming effect. But the high glycine content of bone broth could very well be part of that reason too. Glycine has been shown to help decrease core body temperature which is correlated with deep sleep (source). A 2007 study found that 3 grams of glycine supplementation before bed improved subjective sleep quality and sleep efficacy. As a result the study also reported that it “lessened daytime sleepiness and improved performance of memory recognition tasks.” So basically this study is saying there’s a relationship between getting a good night’s sleep and our ability to think clearly. Go figure! Furthermore, glycine is the major inhibitory neurotransmitter in our central nervous system, meaning it helps to calm us down and stabilize our moods. Imagine your doctor recommending bone broth instead of an antidepressant? I know, that makes me laugh too. 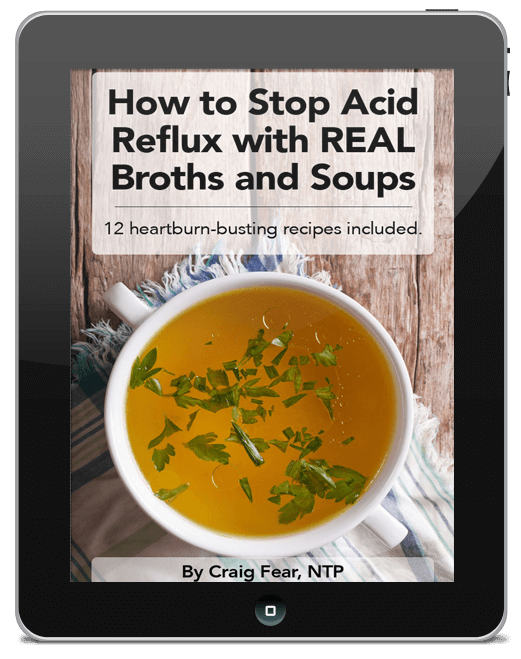 At the very least, instead of supplementing with magnesium or glycine or any supplement or drug for any of the above issues, why not try your own traditionally prepared homemade bone broth first? It’s certainly cheaper, tastier and has less side effects (except maybe for younger looking skin). It stands to reason that bone broth would be a great source of minerals and therefore a good food for bone health. But research from the past and present suggests otherwise. A study back in 1934 found low levels of calcium in bone broths (source). Recent research has also found low mineral levels (source). However, there’s a lot more to the integrity of bones than just minerals. Bone is a living tissue. Inside is a complex matrix of metabolically active connective tissue composed of things like cartilage, nerves, blood cells, marrow, and collagen. Yes, collagen. Collagen keeps bones strong and pliable just as it does other tissues in our body. An over simplistic but perhaps useful analogy is to think of your bones like a lattice-work of bricks. The minerals act as the bricks themselves, and the collagen is the mortar between the bricks that glues and solidifies them together. Studies using collagen hydrolysate have shown an improvement in the bone health of people with osteoporosis and osteoarthritis (source). One study in particular in 1991 compared the effects of collagen hydrolysate vs. calcium on 120 osteoporosis patients and found less overall bone loss and less of a likelihood of bone fractures in those that took collagen hydrolysate (source). In Nourishing Broth (on page 25), a woman reports starting a bone broth diet after finding out she’d lost 12% of her total bone density. The next year she reports a GAIN of 19% total bone density. It’s also interesting to note that the studies that have analyzed the mineral content of bone broth have done so on bone broth alone, not as bone broth has been used in the real world, which is, in combination with other foods. Mineral-rich vegetables, meats, eggs and even dairy (in the form of cream-based soups) are common additions that can boost the mineral content of bone broth. This is one of the many problems with nutrition science that tries to isolate nutrients and study their effects when in reality nutrients are never isolated and work synergistically with each other. While more research is needed to determine the health benefits of bone broth, I trust its wide and varied use around the world as proof of its many health benefits. That’s enough evidence for me. 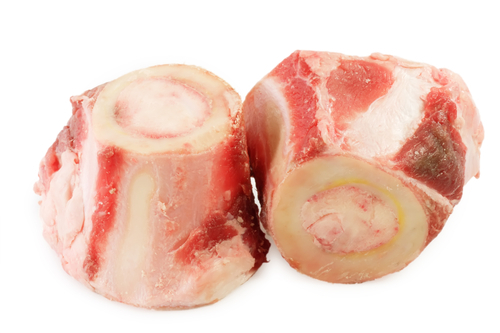 Most people who report bone broth benefits do so for two reasons. First, they’ve started consuming it regularly. And second, because of the other dietary changes they’re making at the same time – reducing sugar, alcohol and processed foods, and incorporating more healthy fats, fruits and vegetables, etc. The bottom line is that your experience is all that matters, not what studies say or other people. If you’re suffering from gut issues or any of the issues listed above, it can’t hurt to try consuming bone broth on a regular basis in conjunction with other dietary changes. It’s pretty darn easy but there are some things that are good to know if you’re new to it. Below is a detailed video I made several years ago for a digestive wellness class I used to teach. It’s a bit long but I think the best part of it is where I compare the different types of collagen-rich bones to use for both beef and chicken broth. You can see that starting around 1:40 mark. You can also find the recipes here. That’s where the fun comes in! The simplest use of bone broth is as a base for soup and the possibilities are infinite. If you want a simple place to start I’d recommend my book, Fearless Broths and Soups. It contains 60 ridiculously simple recipes with chapters on basic broths, creamy vegetables soups, Asian soups, broth for breakfast recipes, seafood soups and simple sausage and meatball soups. If you’re a Thai food fan, you might check out my other broth and soup book, The Thai Soup Secret. If there’s another ethnic food you like, there’s probably hundreds of soup recipes you can choose from. For example, if you like French soups, just google something like “French soups” and you’ll have enough options to last you a few lifetimes. You should also know that I’m in the process of turning this blog into one solely devoted to exploring the world of bone broths and soups! I’m hoping to write many more books on different types of broths and soups from around the world. There’s so much to explore (and eat). Be sure to sign up for my newsletter where you’ll get my latest updates with recipes, cooking tips, health info and lots lots more.